Everything you purchase and sell as part of your business should be set up as a Stock Item within Vinsight. When setting up your stock items for the first time, it is fastest to import the data in bulk from a spreadsheet. See Importing for more information on how to do this. If you are unsure how to fill out any part of a Stock Item, (or any column of the Spreadsheet you are uploading through the importer) see the Stock Items page for detailed, section by section explanations. Bulk Additive: All ingredients/additives (e.g. Malt, Yeast) should have this attribute set. Only stock items with this attribute set will appear in the drop-down list of possible ingredients when creating a new brew, or adding an ingredient to a brew in the App. Packaging: All packaging items (e.g. bottles, caps, labels or cartons) should have this attribute set. Only stock items with this attribute set will appear in the drop-down list of possible packaging when bottling or labeling a product in the App. 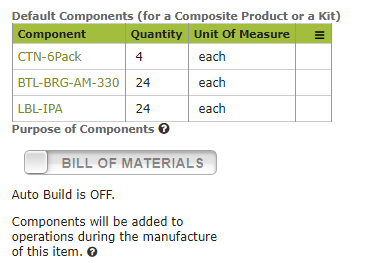 Packaged Item: This attribute should be set for all finished products that you produce, e.g. IPA-330ml-018, Stout-500ml. 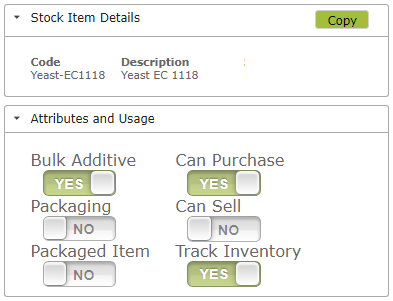 This attribute is used in the App to distinguish the stock items you produce from those used as packaging or ingredients. Can Purchase / Can Sell: Setting the ‘Can Purchase” or “Can Sell” attributes will determine whether these items will appear in the drop down lists for Purchase Orders or Sales Orders. Track Inventory: Select the ‘Track Inventory’ attribute for any items, whose quantity in stock you wish to track. These could be ingredients, packaging, finished items or any other sales or purchase items. If a Stock Item is missing from a drop down list anywhere in the App, it will often be an ‘attribute’ issue. If this happens to you, check that the stock item’s attributes have been correctly selected. This unit of measure reflects the measure that you count the stock in if you were, for example, doing a stock take. Here we count the product in stock in 24 x 330mL units. The conversion rates for the same product might look something like this. . .
meaning that you sell this product in individual 330 mL bottles as well as cases of 6 and 24 bottles. You should not, however, include any non-substitutable product in this conversion table. 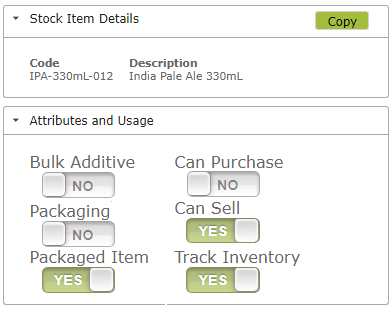 For example if you also sold 12 x 330 mL cans of the IPA, this product should be set up as a separate Stock Item. (While a customer may accept 4 cartons of 6×330 mL bottles as a substitute for 1 24 x 330mL bottle carton, the cans would be regarded as a different product). For an example of ingredient conversions see Stock Items – Conversion Rates.